Try our natural Ruby in Zoisite Rough Satisfaction Guarantee - compare our prices and our superior quality. Click on any ruby in zoisite specimen image below to enlarge it. Ruby Zoisite Specimen Dimensions: 2.2" x 1.7" x 1.4"
This specimen of natural color ruby in green zoisite rough was mined in Tanzania. 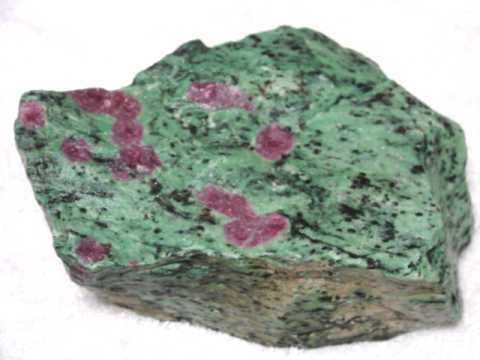 The rubies have rich red color, and the zoisite is a beautiful green with some black hornblende. This ruby in zoisite rough makes a nice mineral specimen just as it is, although it could also be used as superior grade lapidary rough. Ruby Zoisite Specimen Dimensions: 3.6" x 3.5" x 1.5"
This specimen of natural color ruby in green zoisite rough was mined in Tanzania. The upper surface has a 1.5 inch ruby exposed with rich red color as shown. This ruby in zoisite rough makes a nice mineral specimen just as it is, although it could also be used as superior grade lapidary rough. Ruby Zoisite Specimen Dimensions: 4.7" x 4.5" x 2"
This specimen of natural color ruby in green zoisite rough was mined in Tanzania. 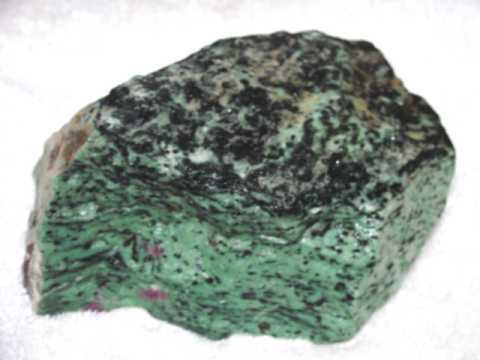 The rubies have very rich deep red color, and the zoisite is a beautiful green with black hornblende. There are more rubies exposed on the opposite side. This ruby in zoisite rough makes a nice mineral specimen just as it is, although it could also be used as superior grade lapidary rough. Ruby Zoisite Specimen Dimensions: 5.8" x 4.4" x 3.2"
This specimen of natural color ruby in green zoisite rough was mined in Tanzania. There is a ruby crystal measuring 1.5 inches long exposed on the upper surface as shown. The photo at left was photographed wet under reflected sunlight to show the true colors. This ruby in zoisite rough makes a nice mineral specimen just as it is, although it could also be used as superior grade lapidary rough. There are more ruby crystals exposed on its backside. See also a back view photo of this natural specimen of ruby in zoisite. Ruby Zoisite Specimen Dimensions: 7" x 5.2" x 3.1"
This specimen of natural color ruby in green zoisite rough was mined in Tanzania. There are several ruby crystals exposed on the fresh break of the upper surface as shown. The photo at left was photographed wet under reflected sunlight to show the true colors. This ruby in zoisite rough makes a nice mineral specimen just as it is, although it could also be used as superior grade lapidary rough. See also a back view photo of this natural specimen of ruby in zoisite. Ruby in Zoisite Carved Bowl dimesions: 7.5" long x 6.1" wide x 1.2"
This shallow dish was handcarved from a single block of natural color ruby in green zoisite rough that was mined in Tanzania. The rubies have rich purplish-red natural color under incandescent light. Handcarved ruby in zoisite carving weighing 1.9 Lbs. This sculpture of a horse was handcarved from a single block of natural color ruby in green zoisite rough that was mined in Tanzania. The rubies have purplish-red color under incandescent light. 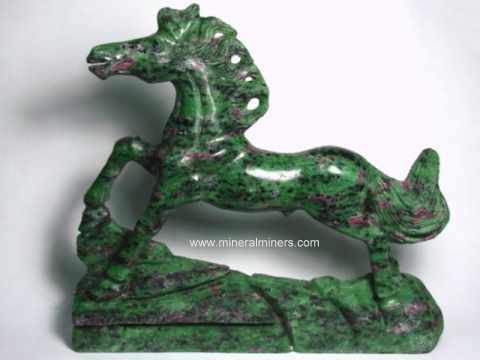 See also a view of the opposite side of this natural ruby in zoisite horse carving. Our Ruby in Zoisite Zoisite rough specimens are all natural color with no treatments of any kind. Red corundum has been popularly known as ruby for thousands of years. See our genuine ruby rings, ruby necklaces and ruby earrings. See also our page displaying all of our genuine ruby jewelry designs. See our pages displaying Genuine Zoisite Jewelry (tanzanite jewelry), including our genuine tanzanite earrings and tanzanite necklaces. Ruby in zoisite is mined at the Tanzanian deposits located near the base of Mount Kilimanjaro. This is the only commercial source for ruby in zoisite rough, and it has been mined there for the last 60 years. Ruby in zoisite is also called anyolite, which is a rock composed of green zoisite matrix with translucent ruby and occasional black hornblende. To see more Zoisite or tanzanite photos, just select another item category from the table below. To see photos of another mineral variety, select any item category link in our Mineral Inventory & Factsheet Index. 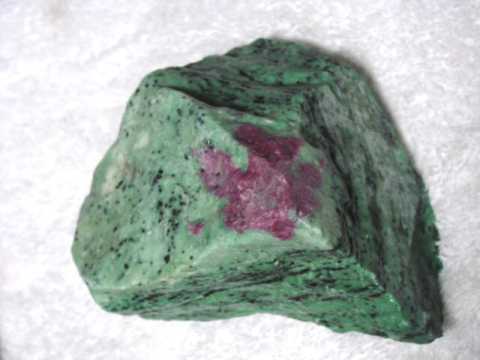 Would you like us to inform you when we add more carved sculptures of natural ruby in zoisite on this page?